Wed, Apr 10, 2019, 11:56 pm SL Time, ColomboPage News Desk, Sri Lanka. 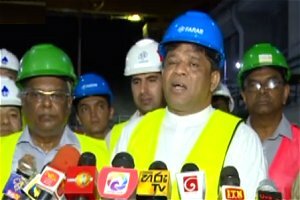 Apr 10, Colombo: State Minister of Mahaweli Development and Environment Ajith Mannapperuma states that the Uma Oya underground hydropower plant will add 120 MW to the national grid by August. The State Minister made this observation while participating in an inspection tour of the Uma Oya Multipurpose Development Project. The Uma Oya development project is being carried out under the guidance of President Maithripala Sirisena as the Minister of Mahaweli Development and Environment. The State Minister also stated that the work on the Uma Oya project will be completed speedily with the power crisis the country is facing at the moment. The underground power plant is being constructed 860 meters under the ground. The Minister also inspected the constructions of the two reservoirs at Puhulpola and Dyraaba, both near Welimada. The multi-purpose project involves the construction of two reservoirs on tributaries of the Uma Oya, which flows down from central hills and join the Mahaweli River, and one tunnel on the Uma Oya to divert water to the power generator further downstream. The water will be diverted to Kirindi Oya basin which will take water to Hambantota through the 25 km long underground tunnel across mountains in Bandarawela by creating a dam at Puhulpola in Welimada and a reservoir in Dyraaba. The water from the Puhulpola Reservoir to the Dyraaba reservoir will be flowed by a 3.9 kilometer long underground tube with a radius of 3.7 m.
It will provide water for agriculture in Moneragala, Wellawaya and Hambegamuwa areas. Agriculture in the lower range of the Kirindi Oya Basin will also benefit from this water. The total estimated cost for the project is Rs. 86 billion.